Webcast-Content: Are you confident that your All-Flash Array is designed for resiliency and availability? Discover why implementing Flash Arrays improves service levels and lowers TCO for your business critical applications such as Oracle, SAP and VMware. In this webcast, Dell EMC will show, why VMAX All Flash provides unparalleled availability with an architecture designed for your most demanding environments. 22. Juni 2017 - How can you bring peace-of-mind to your security-focused organisation once leveraging the public cloud? 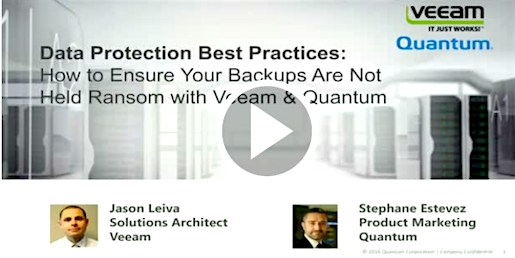 Quantum und Veeam Webinar: How to Ensure Your Backups Are Not Held Ransom by Ransomware! Read more about Quantum und Veeam Webinar: How to Ensure Your Backups Are Not Held Ransom by Ransomware!